After weeks of research and hemming and hawing, while shopping for a new film camera, I did a quick search for the Micro Nikkor 55mm AI-s and spotted this one for a good price, with the PK-13 extension ring that will get it to 1:1. As with many other Nikkor lens/camera purchases, I first checked Ken Rockwell… He is generally glowing about most of the Nikon stuff he reviews, but if something is a real dog, he’ll tell you. His only negative comments on the 55mm f/2.8 AI-s are the relatively short focus distance and only focusing down to 1:2, both of which are perfect for my purposes: 1) scanning negatives and 2) walking around and shooting flowers and whatever. The one issue that I’ve run into so far is the massively long focus throw… it’s almost 180° from Infinity to 1:2. Of course, the vast majority of that is getting from 3′ down to 10″, but if you’re focused at, say 8 feet, shooting some tree limbs, say, and spot a bee hovering around the flowers on the tree, well it’s going to take awhile to spin the lens around and get into bee shooting range. It helps with getting precise focus, for sure, but for quick action it’s a bit fiddly. 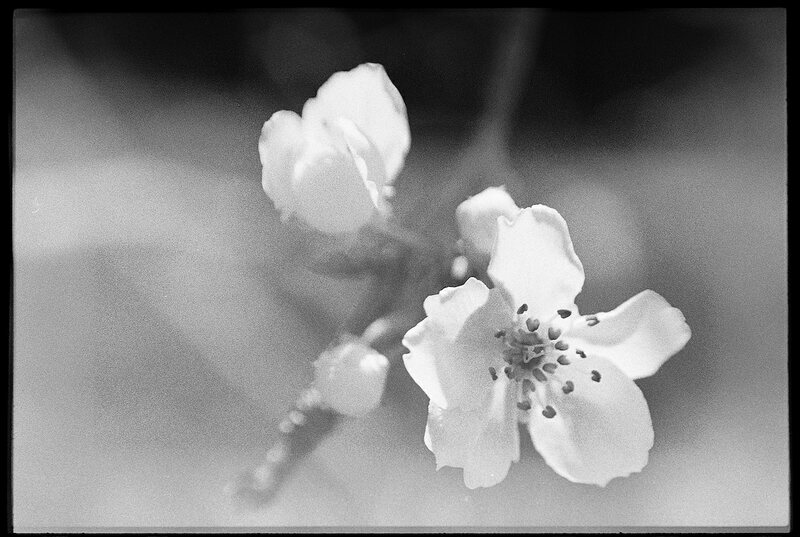 Here’s a blossom on our little Asian Pear tree that I shot with the Nikon FE and Micro 55mm on Ilford HP5+, then scanned with the Scan-O-Matic mk V.
Pretty sharp, and that’s with the wind blowing and me shaking, on film, down in the corner of the frame, with nice soft bokeh and good contrast. 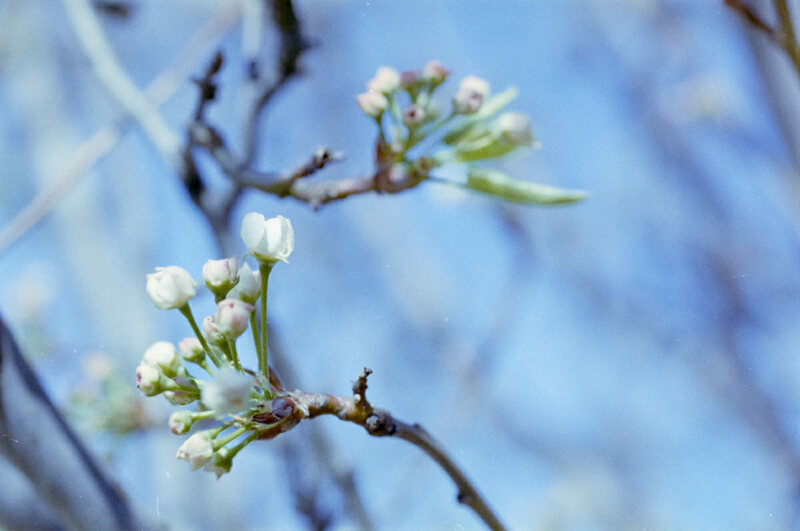 And here’s one, shot on the FG with Lomography Color 100. Not the sharpest picture ever, and the color is probably more attributable to the film and my processing skills, but the bokeh is nice and creamy. Both of the above were shot on film with the 55mm Micro, and then the negatives were scanned via the Scan-O-Matic mk V (aka the D7000 + 55mm Micro + some tape, cardboard, and foam board), but I suppose it doesn’t really give a good idea of what the lens is capable of on digital, so here’s a quick shot of a bit of film on my desk. Apologies for the grain, but I shot it quick-style and needed ISO800 to get a hand-holdable shutter speed at f/5.6 on the PK-13 (which is probably more like f/8, light wise). 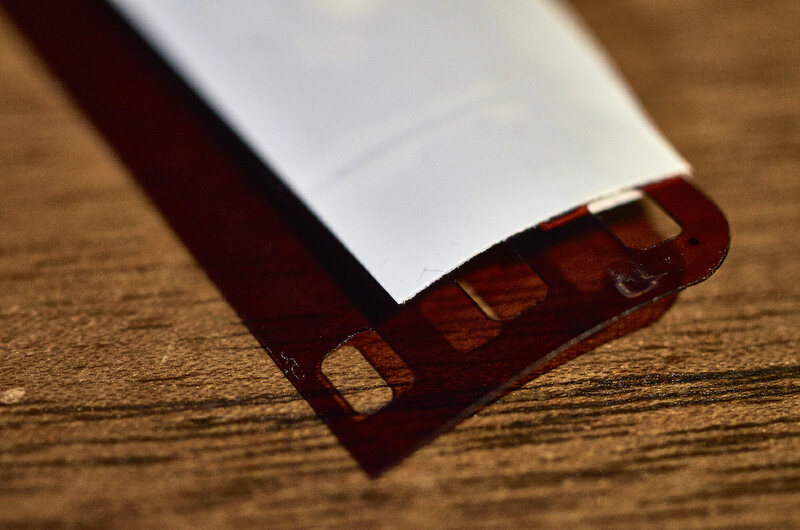 The depth of field is pretty thin, even at f/5.6, but you can see the little bits of fuzz on the edge of the film, and the little mark in the emulsion where I needed to have trimmed my fingernails before playing with wet negatives (more on that later). Give me some more time with this combo, and In sha’Allah I’ll come up with some nice, pretty pictures, with much less hassle than even rotating the collar on the 70-210mm Vivitar Series 1, much less fiddling with the switch on the 28-105D or worrying about dust and whatnot with reversing lenses, or worrying about further damaging lenses by stacking them this way and that on each other. The Micro-Nikko 55mm f/2.8 AI-s is still manufactured and available new, despite the arrival of lenses like the 60mm Micro (that has autofocus and goes down to 1:1, albeit with far more weight and no aperture ring)… That’s probably all the endorsement this great lens needs.